Thank you for your help and responses with regards to my client survey and our site. Just one last problem that I am experiencing. This now works completely but does not register in the back-end of our site. So basically, customers do not have details in our site. 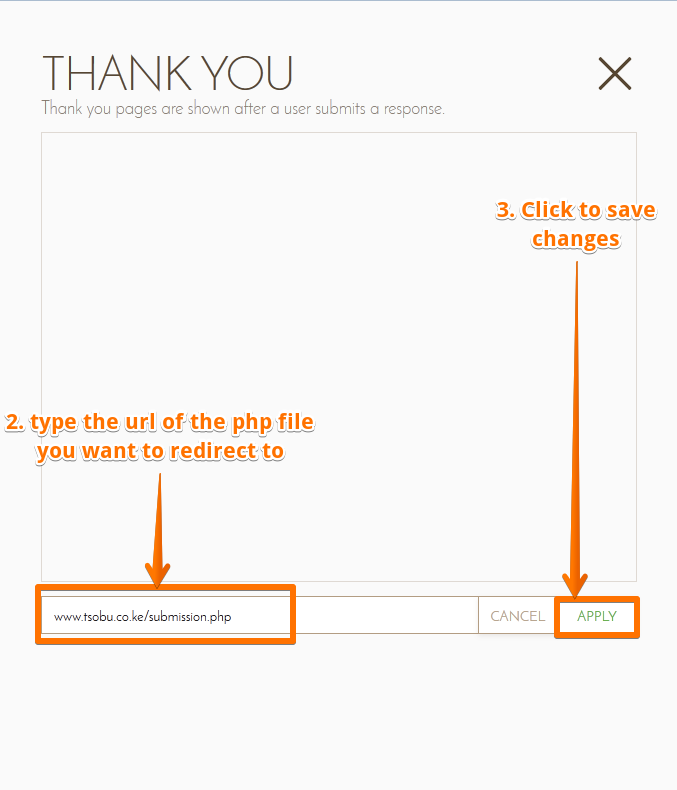 Alternatively to the above, you can Send POST Data From JotForm Using PHP in Custom Thank You Page. 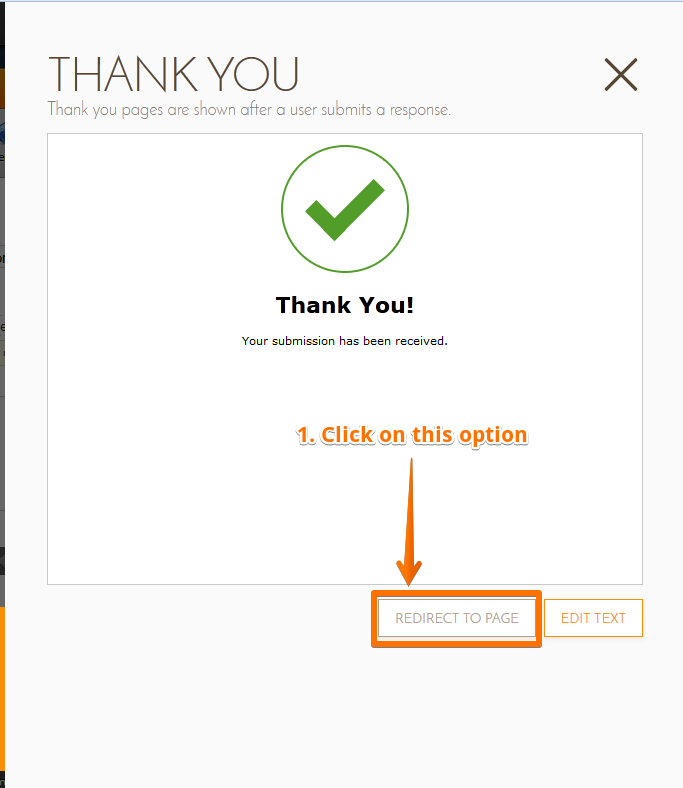 This will enable you to set up forwarding of your submission data directly to your website when a submission occurs. I hope this helps. I am sorry but this doesn’t appear to be working for me. Also, using the other way, my setup and embed isn’t set up in the same way on my page. Can you talk me through this further perhaps? Enzohair - Visit our store! To set this up, you might need to hire a developer or the one who setup your backend to catch the POST Data sent by the form. If you are still having problems, please do provide us more details of your current setup and if you are getting error messages. c. Choose Custom URL and paste the URL above on the box. If I click on Thank you – it just brings up a pop up box on the right hand side - http://www.jotform.com//?formID=52568574343867. There’s no setup and embed for me to click on. Do you have an instructional video? I have also tried using the webhook but this doesn’t appear to be working either. 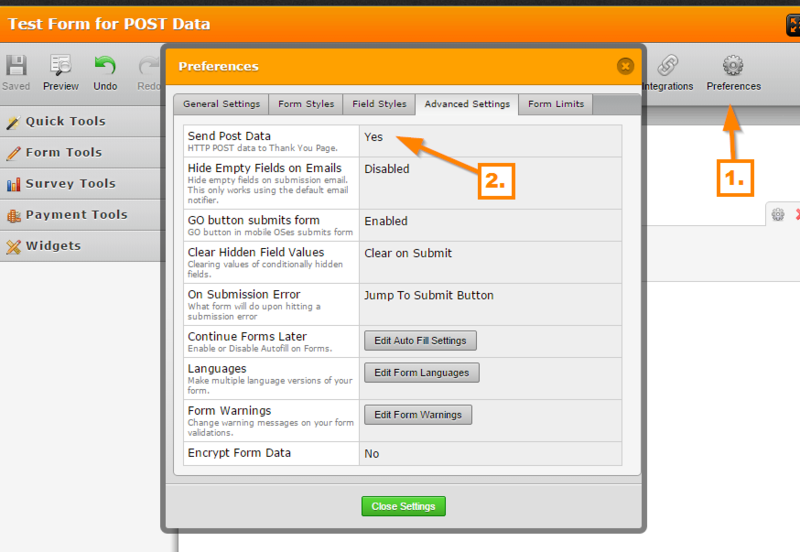 The POST Data option and the URL http://www.jotform.com/show-post-data/ to test and get the correct PHP tags are working in my end. Regarding Webhook, the advantage on that is that you are not really navigated to the URL where your PHP script is located, BUT it will run the script silently and you will still be navigated to the "Thank You" page that you setup. I hope that helps. Please do let us know if you still need assistance on this. I have completed the first part of this but unfortunately, I do not see directions on this screenshot below you have included? I am not a web developer so this is all foreign to me and trying to work it out as I go along! The second form involves setting the for to redirect to a custom PHP page where the form data can be picked and submitted to the back end database. This will require custom code by one of you developers to achieve the submissions and saving process. Next enter the URL you want the form to be redirected to, this will be pointing to a PHP file. You can refer to this guide on how to pick data posted to the PHP page and save it to you back-end database. Please let us know if you will require additional assistance or clarification.